Diagnosed at a young age with ADHD and anxiety, Jaclyn Atkins walks us through her experiences in primary school, college, and afterward. Having addressed her ADHD for all but a few years of her life, Jaclyn shares some of the lessons she has learned, many tips and strategies, how she has overcome tragedy, and her path forward from where she is now. Jaclyn, 23, is located in Toronto. Both of Jaclyn’s parents are diagnosed with different disorders: her father with ADHD, and her mother with anxiety and depression. Her parents realizing at an early age that Jaclyn probably had ADHD, she was brought at age five to her father’s ADHD doctor, who confirmed the diagnosis. Overwhelmed with the “disaster” of provincial school tests in third grade, Jaclyn began taking medication that year and received an IEP the following year. Jaclyn recently graduated from the University of Toronto Scarborough Campus with an honors bachelor’s degree in Science and Mental Health Studies and Linguistics. Following grade twelve, Jaclyn was feeling terrific about her school performance, having been on the school’s honor roll and having received an award. Realizing she had to contact people to set up her education accommodations herself caught her off guard, leading to some struggles along the way. Other major life events, including the death of Jaclyn’s younger sister and a major family feud leading to her estrangement, only added to her challenges during her time in college. Planning to continue her studies, Jaclyn is set to attend another college this Autumn for an associate degree. 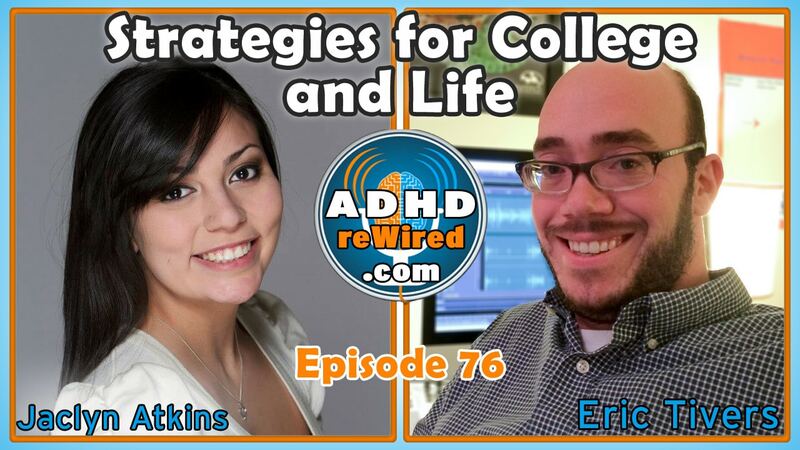 Eric notes how resilient Jaclyn has had to be in order to still complete her college degree despite the challenges she faced from ADHD, tragedy, and family. She, Eric, and others like them who have gone through these major setbacks in life can see them as personal growth opportunities and can provide purpose and meaning to those looking for them. Jaclyn cites her personality and social relationships as major factors contributing to her ability to continue through her studies as well as she has. After her younger sister died, Jaclyn felt like a switch turned in her brain. She took charge, calling friends and family, organizing details of the funeral, and stepping up to help out. Now, three years later, Jaclyn is very much more active in volunteering her time: she is an advocate for organ donation, has helped to raise over $12,000 for Crohn’s and Colitis Canada, has spoken at events hosted by Starlight Children’s Foundation, volunteered at camps for children with cancer and for other bereaved children, and has tried to embrace attributes that exemplify her sister. As a kid, Jaclyn remembered looking up to people her age. She wants to be someone that children can look toward to see how it’s possible to be moving forward with their lives and being successful, despite their relatable experience. Eric: “We can spend a lot of time planning our life, but then life happens.” We can decide how to handle the unexpected circumstances in life. We can curl up in a ball in the corner. Or, we can take time to grieve, experience the sadness and loss, try to create meaning, and then move forward. Jaclyn’s parents instilled in her at a young age the importance of being a self-advocate. Teachers might not always agree with suggested accommodations or feel they have to accommodate a particular student, so standing up for oneself and speaking up is important. What with Jaclyn growing up needing various accommodations, she understood as second-nature the need to speak to teachers to make sure they were aware of the accommodations. Jaclyn wishes teachers would be better informed about the accommodations and how they impact students. Eric: Sometimes the informal accommodations allowed by instructors were more effective than the formal ones: for example, taking test with extended time in the classroom as opposed to the testing center and renegotiating assignments to be more personally interesting. Developing a positive relationship will your professors can go a long way to helping with your accommodations, both formally and informally. In school, Jaclyn was allowed to use a computer to type up her notes after she was retested. The psychologist noted, in addition to issues with executive functioning, that Jaclyn had short term memory problems. Eric notes that a poor working memory is a major hindrance for those with ADHD. Jaclyn mentions struggling with writing notes. One of her accommodations was to have another person write notes for her during class. Eric mentions the alternate note-taking strategy of doodling notes. Eric suggests the Livescribe Smartpen, a pen that can record your written notes into a digital format as they are written, record spoken audio, and then play back what it recorded at specific times. So, one could take notes at a business meeting and then cue the pen afterward to play back what was being said at the time a particular word or line of notes was being written. Typing on a keyboard is Jaclyn’s preferred method of note-taking, since she tends to write at a slower pace and her hand will become tired quickly. Eric will sometimes use voice dictation to help him find correct spellings. An iPad is Jaclyn’s most-used device; she doesn’t own a cell phone. Originally, she planned to use the iPad mainly for reading the PDFs and digital text books for her classes. What she ended up using most was its calendar. The built-in calendar application (originally iCal, now called Calendar) in conjunction with iCloud, lets Jaclyn access her calendar on her iPad, laptop, and virtually any internet-connected computer. Jaclyn color codes her calendar entries: appointments are green, classes are purple, personal items are red, assignments are black, exams are blue, volunteer work is a different green, and family items are yellow. A new feature in iOS 8 lets Jaclyn invite her family members to her calendar to share schedules, see where they are, share applications and media, etc. Emoticons are useful to Eric in order to make the descriptions of his calendar listings more visually comprehendible. Carolyn D’Argenio suggested to Jaclyn the application Leave Now, which automatically imports one’s calendar, lets them select their mode of transport, and will remind someone to leave ten minutes before they need to. The Blackboard application, which a lot of colleges and universities use, lets students access their class materials, forums, assignments, and will notify them if there are new updates or changes. Other applications she uses include basics like one to record audio, one to read PDF files, a text-to-speech program, and more. Jaclyn’s favorite application since she started attending university is one called “My Grades”. It helps keep track of course syllabi and grades received. It then can calculate, based on the percentage worth of each grade’s genre, what grades someone will need to receive in order to obtain a certain final grade. When first receiving your syllabus, assignment due dates, and schedule, make sure to add them to your scheduling and management applications right away without waiting. She cites Facebook, Buzzfeed, Pinterest, as her most egregious time sinks. If you could create an invention, or improve upon an existing one, what would it be? Blackboard Mobile Learn, an application for managing college classes (must be supported by your college or university). Donate to help Carolyn D’Argenio afford a continuous glucose monitoring system (CGM) for her son’s type 1 diabetes. Eric has set September 14th as the start date of the Fall 2015 session of the ADHD reWired Coaching and Accountability Group. If you are interested in reserving a spot in the group, visit coachingrewired.com.